Everyone is still sick around here! This is just crazy!!!!! Poor Lizzy is finally starting to feel human - even if she doesn't quite look it yet. Mom is putting on a brave front but has no energy at all and one of the worst coughs I have ever heard! The baby is feeling good but still very congested. I am trying my hardest to be a good nurse but still stay away from all of them! No towels in the bathrooms, just rolls of paper towels and cans of Lysol in every room! Yes - if you didn't know it I am a germ-a-phobe! Hangin' In There. . . Still have sick-os in my house - poor Lizzy is really sick! I am still hanging out at B&D's house watching the baby to keep her away from all of the germs. She and I had a very lazy day today - we watched cartoons and napped all afternoon! Hopefully next week will get back to normal. I hope you all are having a great week so far!!!! So Much to Do!!! So Little Time!!!! That is how I am feeling today! Seems there are 1001 things that need to be done that only I can do and there just doesn't seem to be enough time and energy to get them all done. It has been this way for a couple of weeks now. Hopefully soon everyone will stop being sick and I will get all caught up! 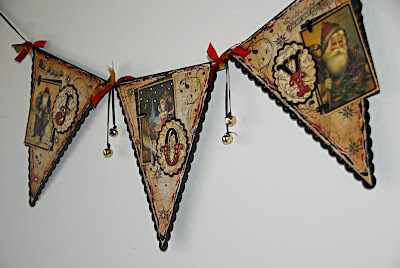 Meanwhile here is the much awaited sample for the Christmas Banner Class. I will se teaching this once on Sunday, Nov 15th for only 12 students. The sample will be in the store this Saturday for you to see in person, but the sign-up sheet is already in the store if you just want to call to sign up. Click on photo to see more images. 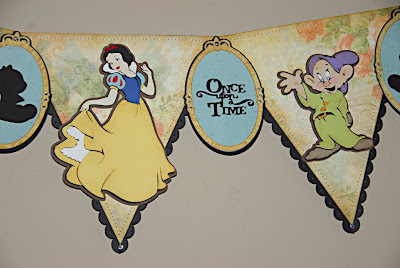 This past Friday was my Mother's Birthday and since she is a HUGE Snow White fan and has her room completely decorated in shabby chic and Snow White I decided to make this banner for her. It turned out really cute and she really likes it - score! Sadly, she has been very sick and so her birthday was nothing special for her. Poor Lady. Hopefully we can get everyone well and celebrate it next weekend???? She is starting to feel better and I was so happy about that. But when I woke up today I found that Lizzy is now sick!!!! Geez - I need this to all stop and for these sick-os to stay away from me! Monkey has been sick for a couple of weeks. She managed to get a parasite (highly contageous) at the water park. Poor little Monkey - she just did not understand why she felt so bad. 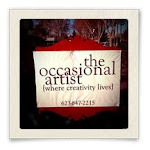 Well, I guess I should get back to getting busy!!! I hope you all have a great week. Remember to wash your hands and not touch your face unless you're feeding it or washing it!!!! Let's ALL try to stay well this season! Just busy busy busy! Classes, sick people, birthdays and life have all kept me away. But I will be back soon. I hope you all are doing great and staying well.